Length of the tropical year, defined as the average interval between vernal equinoxes. This calendar year was the objective of the Gregorian calendar reform, which finalized the calendar as we use it today. Lengthening of the vernal equinox year over the last two millennia. Variation of this length in the next few millennia. Lunar month in 2000 C.E. Date Emperor Huangdi invented the Chinese calendar (legend). 354 days (lunar year) with days added at intervals to keep the Chinese lunar calendar aligned with the seasons. 354 days, with days added. 304 days, amended in 700 C.E. to 355 days. The year according to Julius Caesar. Also known as The Julian calendar. On this date Caesar changed Roman year to his own Julian calendar. Time the old Roman calendar was misaligned with the solar year as designated by Caesar. Total length of 45 B.C.E., known as the "Year of Confusion," after adding 80 days. Date Sanhedrin president Hillel II codified the Jewish calendar. The year as amended by Pope Gregory XIII (Gregorian calendar year). On October 15, 1582, the gregorian calendar replaced the Julian calendar, in use since 45 BC. Length of time the Julian calendar overestimates our calendar year per year, as determined by Pope Gregory. 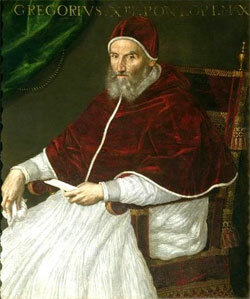 Days Pope Gregory removed to correct the calendar's drift. Dates Gregory eliminated by Papal bull to realign his calendar with the solar year. In these years most Catholic countries accepted the Gregorian calendar. The years Protestant Germany accepted the Gregorian calendar. Partial in 1700, fully acceptance in 1773. In this year Great Britain (and the American colonies) accepted the Gregorian calendar. Days eliminated by the British Parliament to realign the old Julian calendar with the Gregorian calendar. In this year Japan accepted the Gregorian calendar. In these years Russia accepted the Gregorian calendar. Date China accepted the Gregorian calendar system. In 1971 the Eastern Orthodox Church last voted to reject the Gregorian calendar and keep the Julian calendar. Length of time the Gregorian calendar is off from the average vernal equinox year. Length of time the Gregorian calendar has become misaligned with the vernal equinox over the years since Gregory's reform in 1582. The representation of the time of day using units which are decimally related. 4th or 5th millennium C.E. When the Gregorian calendar will become twelve calendar hours ahead of the astronomer?s mean tropical year. beyond the 7th millennium C.E. When the Gregorian calendar will become twelve calendar hours ahead of the mean vernal-equinox year. 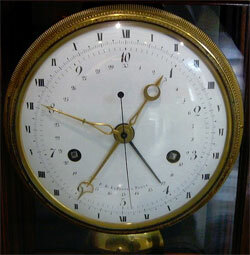 Year the Atomic Time replaced Earth Time as the world?s official scientific time standard. time it takes for 9 192 631 770 oscillations of the Cesium atom at zero magnetic field. The mean vernal equinox year expressed in oscillations of atomic cesium at the year 2000.